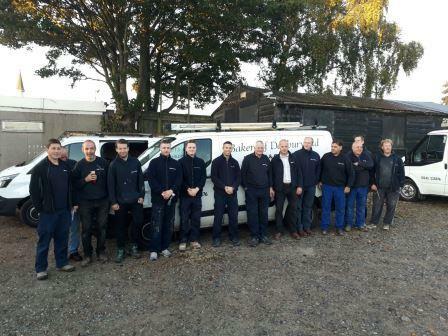 Bakers of Danbury's in-house joinery workshop recently built and donated a new duck house to the village. Bakers of Danbury takes pride in supporting both our local community and the communities in which we work - sometimes through sponsorship or even offering a helping hand. We thought our ducks needed a new home! 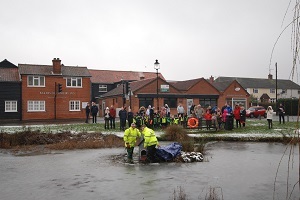 On Friday 1st February representatives of Danbury Parish Council, Bakers of Danbury Ltd, children from the ECO Council for St John’s C of E Primary School, children from Heathcote Preparatory School and some local residents all braved the cold, wet and snowy weather and met on Eves Corner Friday morning to watch the ducks officially take up residence in their new home. 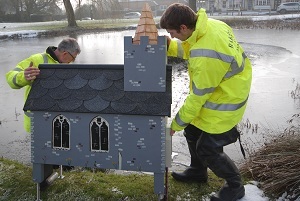 The duck house design has taken inspiration from the The Parish Church of St John the Baptist. St John’s stands high on Danbury ridge, as a landmark whose spire is visible from the A12 and from many local vantage-points. “The guys in our church department, who overlook Eves Corner, felt sorry for the ducks in their wonky house with holes in it. 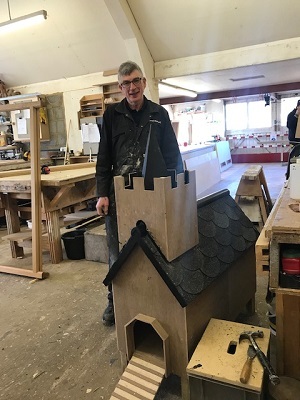 The church duck house design seems very fitting for Bakers, as they are well known for their conservation work to churches, ancient monuments and cathedrals, as well as work to listed buildings and private homes. Bakers have recently carried out conservation works to both St Paul’s Cathedral and Westminster Abbey amongst other ecclesiastical buildings. Bakers’ in-house joinery workshop handcraft bespoke joinery and furniture. The joinery shop meets all the joinery requirements of the company, as well as taking orders directly from clients for projects such as bespoke kitchens, dressing rooms, furniture for business reception areas and bespoke ecclesiastical items. The duck house is something a little out of the ordinary them! 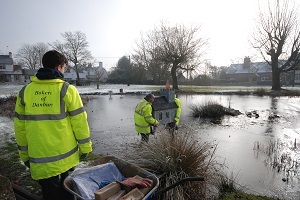 Bakers took advice from The Essex Wildlife Trust who suggested the duck house should be installed in time for early spring as the Ducks will be looking for nesting sites then. 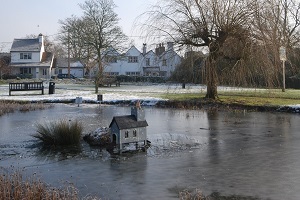 The duck house has two nesting boxes – a door for each box can be found at either end of the house. Each nesting box has a floating ramp leading from the house into the water. 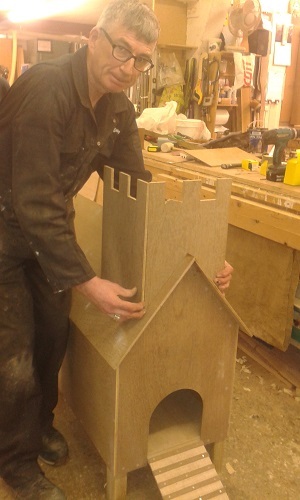 Bakers joinery shop made the duck house from weatherproof ply with a felt roof and a spire covered in Cedar shingles. Over time the Cedar will go a dark grey, more like the colour of St John’s Spire. The tower has been thoughtfully designed to capture the rain water on a felt roof within the tower and redirect it back out from under where the tower meets the church. Our Winter 2018 newsletter looks at projects recently undertaken by Bakers of Danbury and it's sister companies Collins and Curtis Masonry and Pickford Builders. We have recently completed a new build consisting of four apartments on Mill Lane opposite Maldon Promenade, Maldon, Essex. The apartments are on the market now. We were pleased to have been awarded extra masonry conservation works at the College of Arms in London. The College of Arms is a royal corporation acting on behalf of the Crown in all matters of heraldry, the granting of new coats of arms, genealogical and heraldic research, recording of pedigrees and matters relating to the flying of flags on land. We have also been awarded additional conservation works at Coalhouse Fort, Tilbury, Essex. Coalhouse Fort was built between 1861 and 1874 to protect England from invasion by the French and used again during WW1 and WW2. 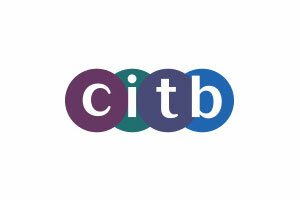 We look forward to starting a number of new projects in the New Year including an extensive refurbishment of a fire damaged barn in Essex, the rebuild of St John's Abbey precinct wall in Colchester, stone repairs to Rivenhall Place, reroofing and masonry repairs to St John the Evangelist Church in Bury St Edmunds, an installation of a new kitchen, w/c and mains services to St Catherine's Church in Littlington and timber repairs to a both a house in Layer Marney and a barn in Blackmore. You can also keep up-to-date with Baker’s latest news by visiting our latest news page and our Facebook page! 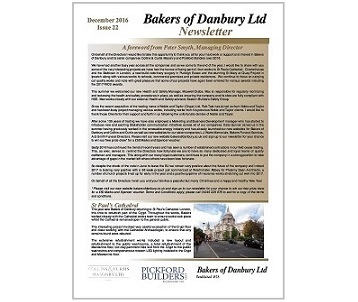 This newsletter looks at projects recently undertaken by Bakers of Danbury and it's sister companies Collins and Curtis Masonry and Pickford Builders. 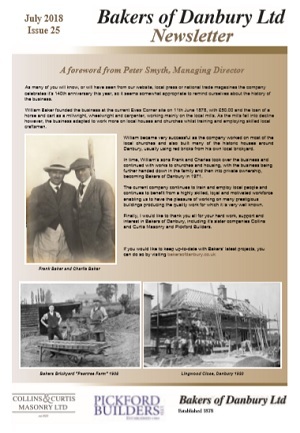 As many of you will know, or will have seen from our website, local press or national trade magazines; Bakers of Danbury celebrates it's 140th anniversary this year, so it seems somewhat appropriate to remind ourselves about the history of the business in our Summer Newsletter. William Baker founded the business at the current Eves Corner site on 11th June 1878, with £50.00 and the loan of a horse and cart as a millwright, wheelwright and carpenter, working mainly on the local mills. 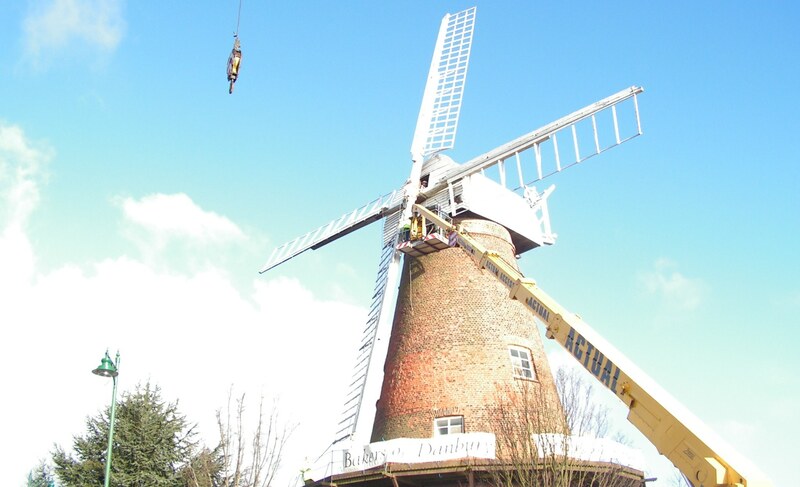 As the mills fell into decline however, the business adapted to work more on local houses and churches whilst training and employing skilled local craftsmen. William became very successful as the company worked on most of the local churches and also built many of the historic houses around Danbury, usually using red bricks from his own local brickyard. In time, William’s sons Frank and Charles took over the business and continued with works to churches and housing, with the business being further handed down in the family and then into private ownership, becoming Bakers of Danbury in 1971. 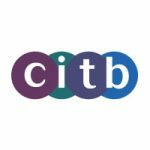 The current company continues to train and employ local people and continues to benefit from a highly skilled, loyal and motivated workforce enabling us to have the pleasure of working on many prestigious buildings producing the quality work for which it is very well known. Monday 11th June marked Bakers of Danbury 140th anniversary. William Baker opened the business on 11th June 1878 as a “Millwright, wheelwright, carpenter etc”, with £50 and the loan of a horse and cart . With the demise of mills there were few mill jobs after the 1890’s, at which point William Baker concentrated on building and a small amount of church works. 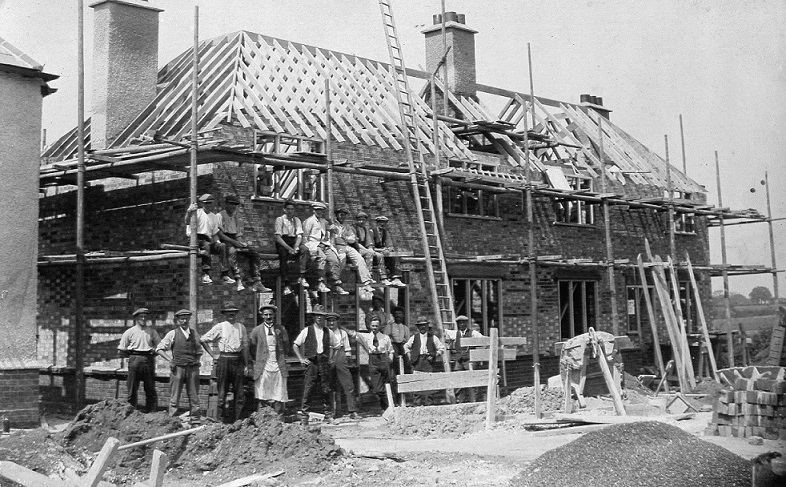 The first house William Baker built was at a cost of £170 in 1880. 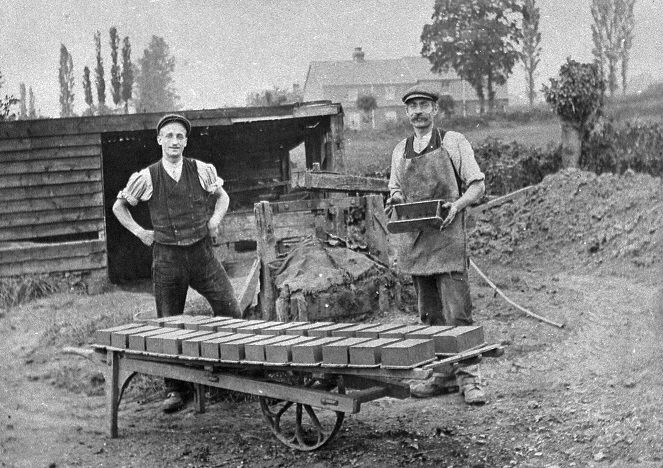 The many houses that followed were built with bricks supplied from William Baker’s brick yard. 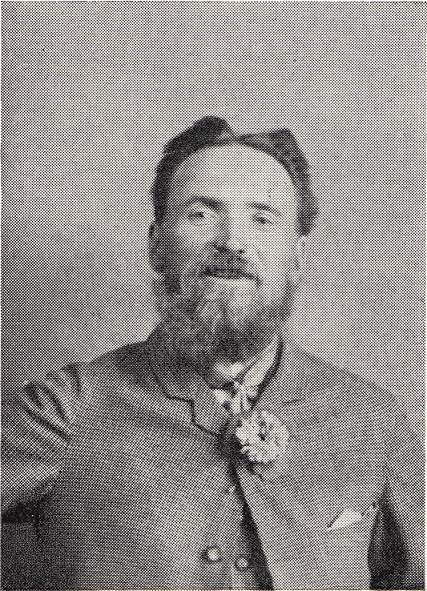 William Baker became very successful, carrying out general building works. 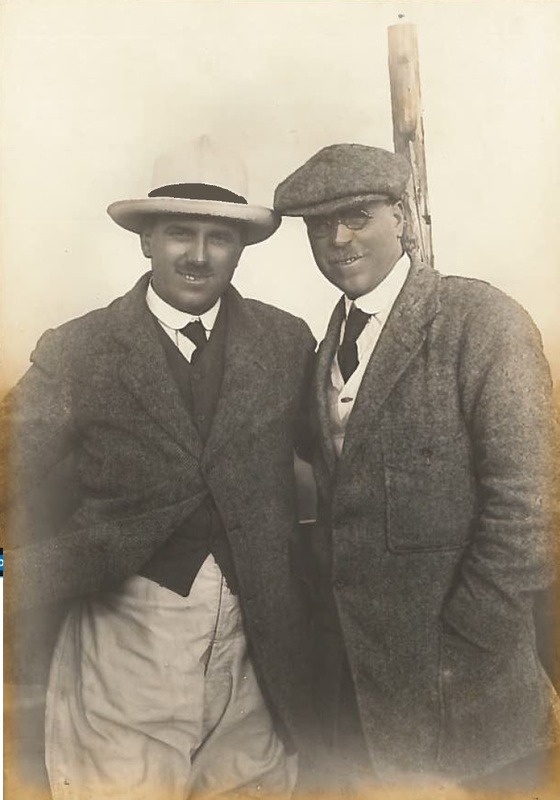 In 1904 William Baker retired leaving the business to his sons - the business became “Baker and Sons”. Charlie Baker’s main interest was in building and Frank Baker’s main interest was in church restoration work. 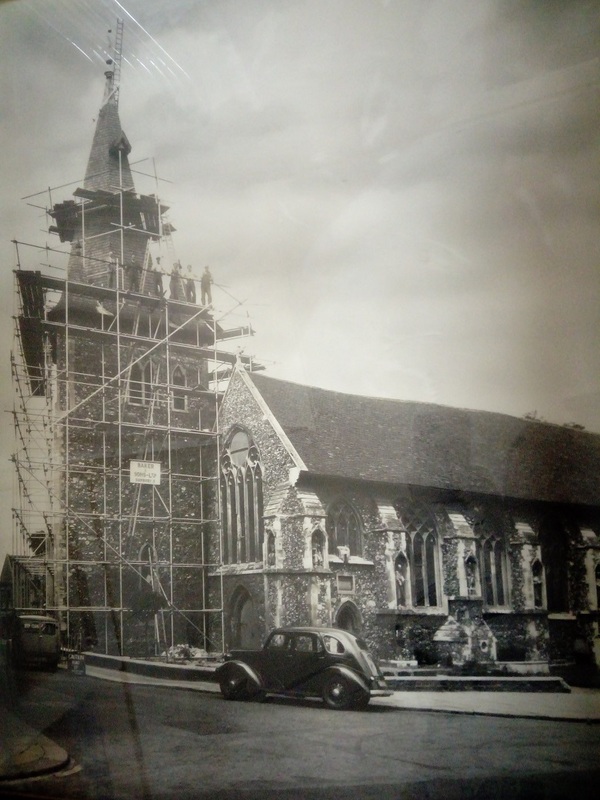 The restoration of the spire to the local church Danbury St John the Baptist in 1922 was their first major undertaking in church restoration work. Being the only builder of size in the area, Baker and Sons were approached by clients wishing to acquire land and have a house built in the area. For these houses, Baker and Sons generally made use of red facing bricks manufactured in their own brickyards, and therefore much of the architecture you see today as you walk around Danbury and surrounding villages can be identified as the work of Charlie and Frank Baker. The business was handed down to family members over the years and became “Bakers of Danbury Ltd” in 1971. Today, Bakers are still known for their expertise on historic and listed properties, and interestingly, many of the methods used in conservation and restoration work remain very similar to those used over a century ago. Bakers of Danbury has 5 Directors one of which is Antony Wood, the son of David Wood (Director from 1965 until 2005). Bakers are currently working on Westminster Abbey, and in the past 12 months have carried out restoration and alteration works to The Charterhouse in London, Westminster Cathedral and St Pauls Cathedral amongst many other projects. Recent projects have won the following prestigious awards; RICS National Award 2017 for Building Conservation, RIBA National award 2017, Civic Trust 2018 AABC Conservation award and a Diocese of Chelmsford, Design Award 2017. 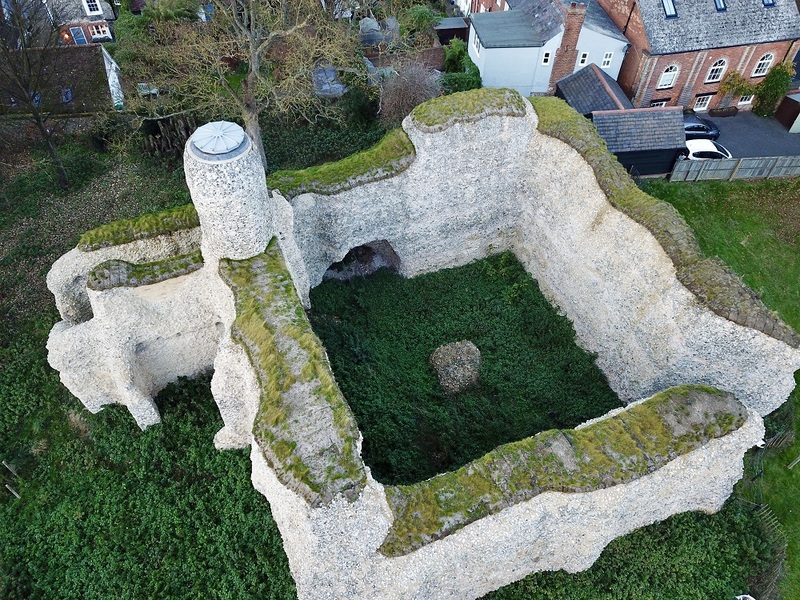 Other interesting projects include the soft capping conservation work to the Norman high flint walls of Walden Castle in Saffron Walden, Essex (2017), various restoration works to the Norman Colchester Castle, Essex (since 1985) and Colchester’s Roman Walls, repairs to a number of local windmills, and various restoration works and preventative maintenance carried out to St Albans Cathedral (since 1984) and Chelmsford Cathedral (since the 1960’s). Bakers benefit from a team of experienced stonemasons, carpenters, joiners and other tradesmen. The longest serving having worked up through our apprenticeship scheme has been with Bakers over 35 years! 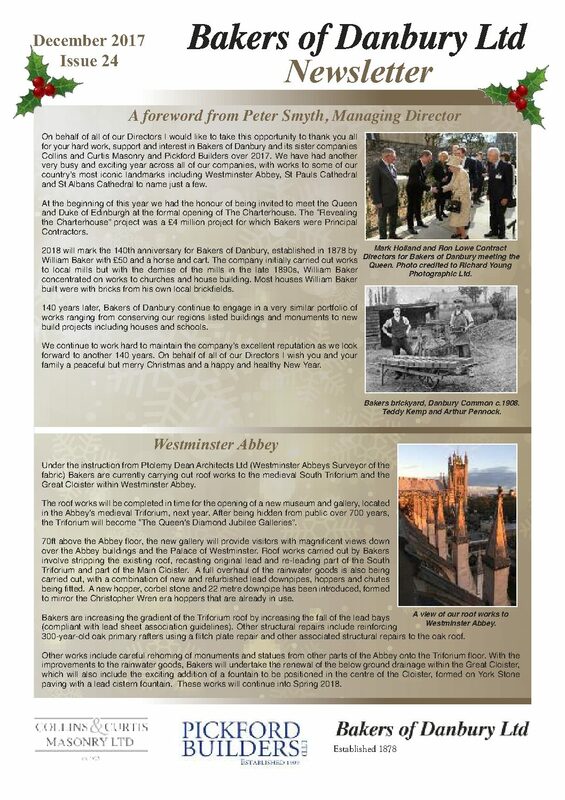 We have had another very busy and exciting year across all of our companies, with works to some of our country’s most iconic landmarks including Westminster Abbey, St Pauls Cathedral and St Albans Cathedral to name just a few. 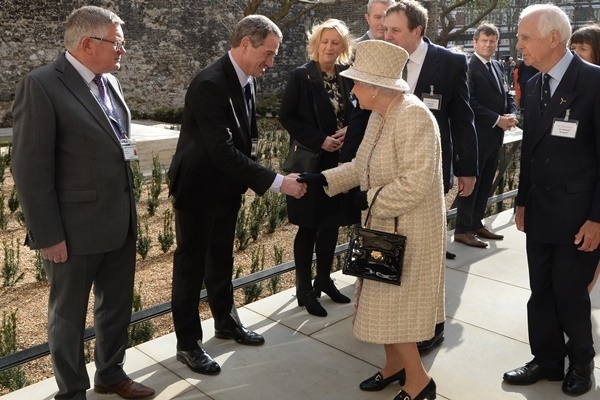 At the beginning of this year we had the honour of being invited to meet the Queen and Duke of Edinburgh at the formal opening of The Charterhouse. The “Revealing the Charterhouse” project was a £4 million project for which Bakers were Principle Contactors. It involved the remodelling of a Grade I Listed building to house a new museum and learning centre as well as other conservation and restoration works. 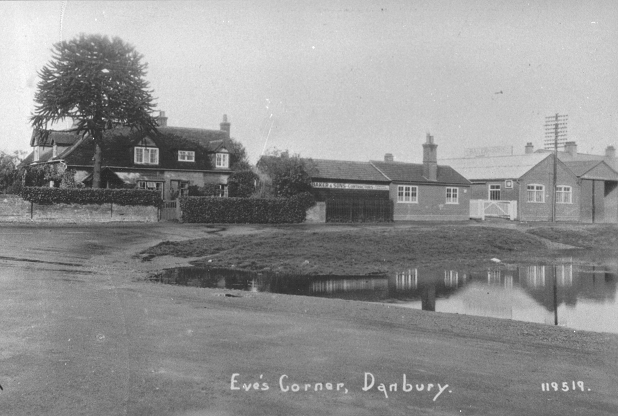 2018 will mark the 140th anniversary for Bakers of Danbury, established in 1878 by William Baker with £50 and a horse and cart. The company initially carried out works to local mills but with the demise of the mills in the late 1890s, William Baker concentrated on works to churches and house building. Most houses William Baker built were with bricks from his own local brickfields. 140 years later, Bakers of Danbury continue to engage in a very similar portfolio of works ranging from conserving our regions listed buildings and monuments to new build projects including houses and schools. We continue to work hard to maintain the company’s excellent reputation as we look forward to another 140 years. On behalf of all of our Directors I wish you and your family a peaceful but merry Christmas and a happy and healthy New Year. 2017 has certainly been a year to remember for Bakers of Danbury! 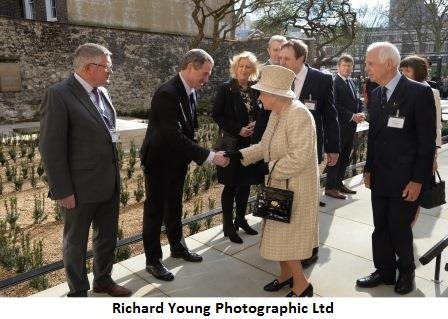 In February we met the Queen and Duke of Edinburgh when they formerly opened the Charterhouse, London. 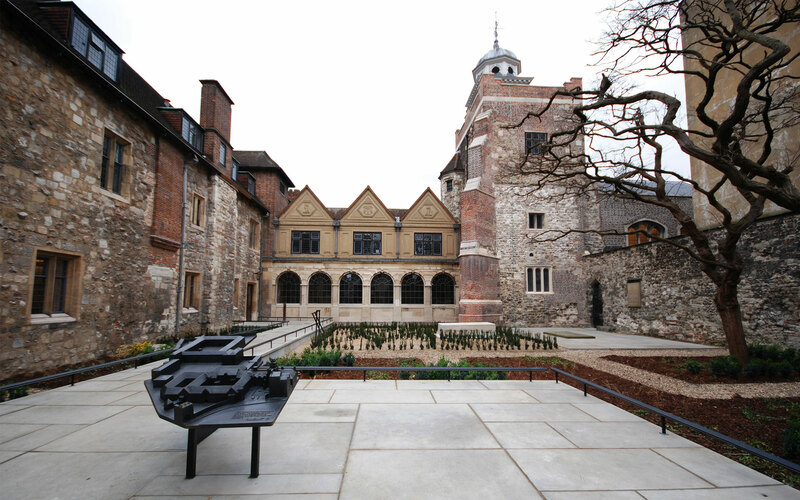 We had been principal contractors for the works at the Charterhouse which involved remodelling the Grade I listed building to house a new museum and learning centre, amongst other conservation and restoration works. We are also delighted with the recognition we have received for some of our recent projects, having been awarded a RICS East of England 2017 award for Building Conservation, two RIBA East 2017 awards and a Diocese of Chelmsford 2017, Design award! 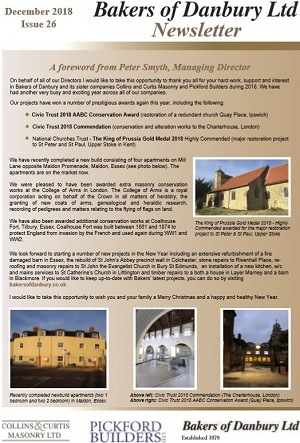 The Summer Newsletter provides a short description of some of our latest projects including the restoration and remodelling works to the Grade I Listed Charterhouse in London, conservation works to The Cathedral and Abbey Church of St Alban, the restoration of the King Harold Memorial at the Waltham Abbey Church and a recently completed double storey extension to a Grade II listed home. The newsletter also features updates from our sister companies Collins and Curtis and Pickford Builders. 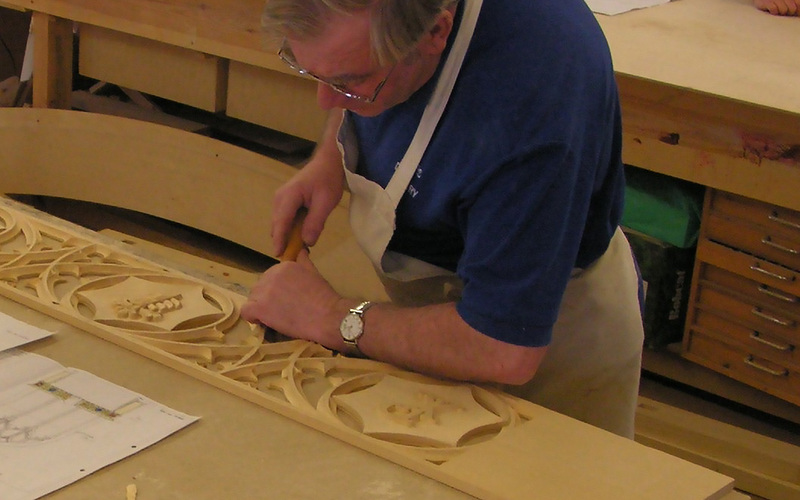 If you haven't already done so, please watch the short film of one of our Joiners hand carving a crocus detail for works taking place at St Marys Church, Saffron Walden, Essex. The skill involved really is something to be admired. 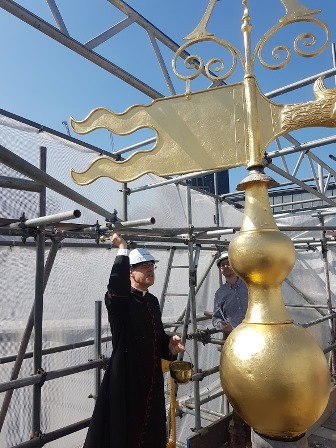 The Ven Luke Miller, Archdeacon of London, recently visited St Anne and St Agnes Church in the City of London, where he blessed the new spire and weathervane, which have been rebuilt following extensive restoration works carried out by Bakers of Danbury. The Grade I Listed church dates from the 15th century. 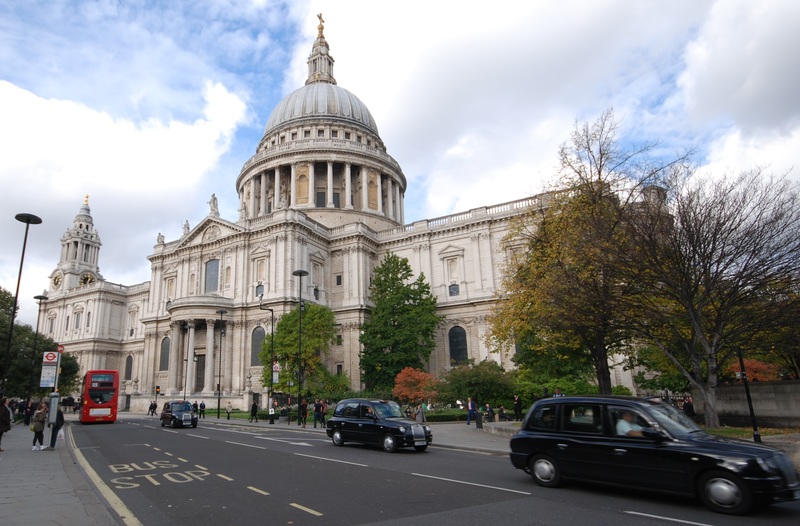 The church was restored by Sir Christopher Wren after the Great Fire of London and later survived the London Blitz. 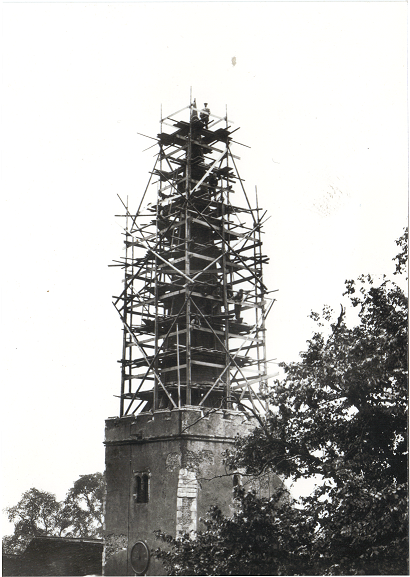 The restoration work carried out by Bakers of Danbury included the extensive refurbishment of the tower and roof, together with external redecoration. The works were made possible by a grant from the National Heritage Memorial Fund. Having been hidden from view and closed to public for over 650 years - the Charterhouse, a historic London landmark was recently opened to public by Queen Elizabeth and Duke of Edinburgh (28 February 2017). The Queen also unveiled a plaque to mark the occasion. 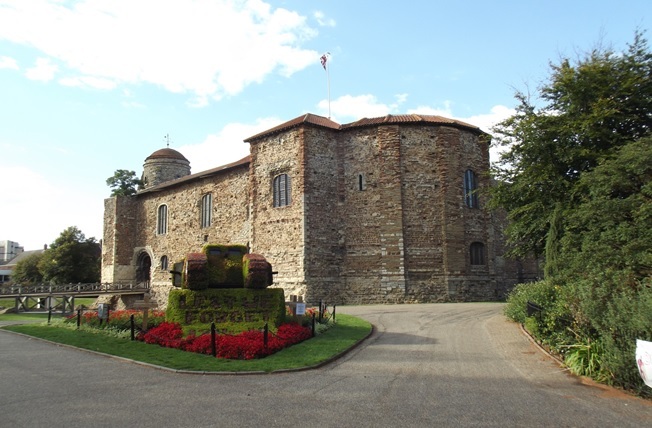 In recent months Bakers of Danbury have been Principal Contractors for the works to the Charterhouse. 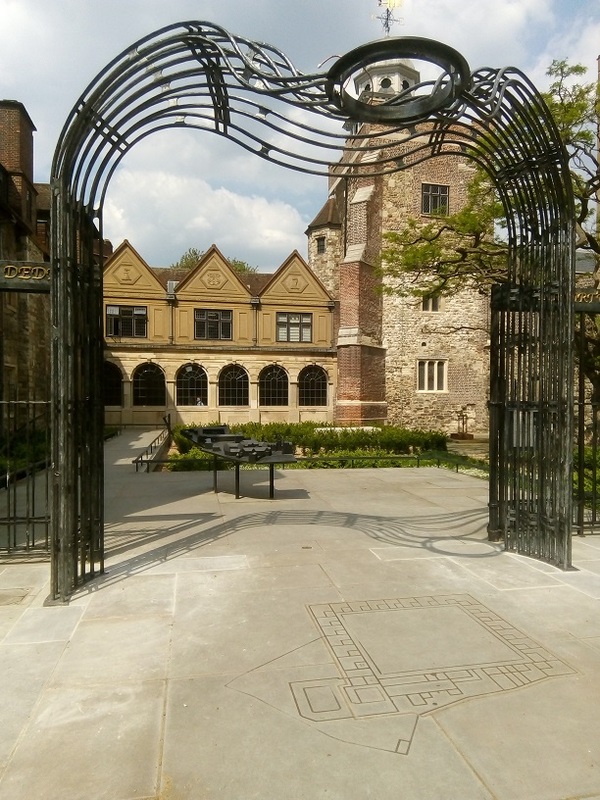 The project “Revealing the Charterhouse”, included remodelling of the Grade I listed building to house a new museum and learning centre; which explores the history of the Charterhouse from the Black Death to present day. “We are hugely grateful for the works carried out by Bakers of Danbury and for their unwavering dedication to the Revealing the Charterhouse project. The skilled craftsmen from Bakers work to an extremely high standard producing a finish which has exceeded all of our expectations. They were a pleasure to work with, always keeping to their word, and we couldn’t be happier with their overall approach and diligence. I would recommend Bakers of Danbury to anyone." 2016 was another busy year for all of our companies. We would like to share with you, some of the very interesting projects we have had the honour in being part of; from works to St Pauls Cathedral, Charterhouse and the Barbican in London, a new build veterinary surgery in Purleigh Essex and the stunning St Mary at Quay Project in Ipswich along with various works to schools, commercial premises and private residences. Founded over 130 years ago, Bakers of Danbury have long been associated with many of the regions' fine historic and listed buildings, churches and monuments. The recent acquisition of the trading name Noble and Taylor will help strengthen Bakers of Danbury’s work in this and other specialised markets. Like Noble and Taylor; Bakers of Danbury’s projects also encompass new developments and refurbishment in the educational, commercial, residential and health sectors. "We are very pleased to announce that we have acquired the trading name of Noble & Taylor (Ongar) Ltd and we believe that Bakers of Danbury will be able fill the gap in the market caused by the unfortunate cessation of trade of Noble & Taylor. 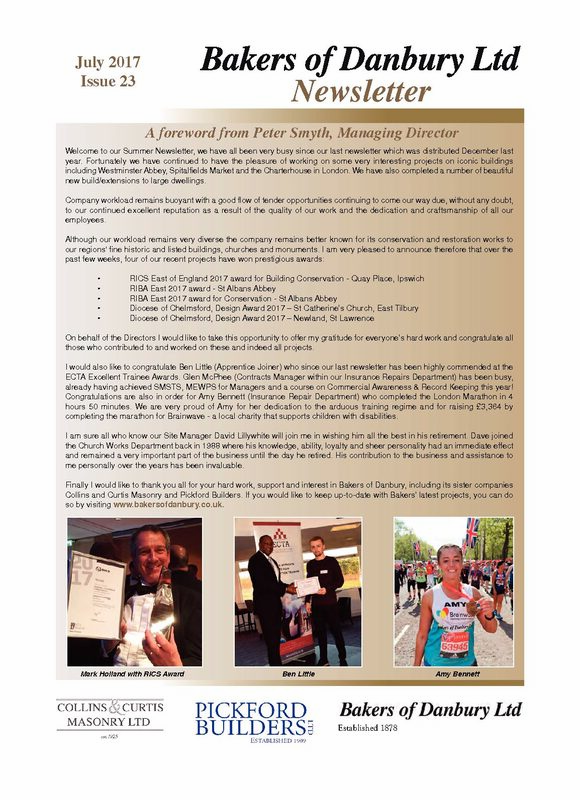 We have known Noble & Taylor for a long time as fellow contractors and seen the quality of their work and their innovative approach and are aware that the ethos of both companies has always been very similar."